Super Affiliate Network Review – Can Misha Wilson Make You Rich? Hi, and welcome to my review of the Super Affiliate Network, I have been wanting to review this company for a while now, but other commitments meant I have had to put it on hold. However, I recently received an email promoting the Super Affiliate Network and decided now was the time to finally check this company out and see what all the hype is about. Before I go on with my review, I must be transparent, I am not fond of companies that follow the MLM business model, you can find out why here. Suffice to say that most MLM participants fail and most people end up making a loss. Why did I mention MLM? Because despite what the Super Affiliate Network claims, it is an MLM company. And like all MLM companies, they peddle average products at above-market prices. The Super Affiliate Network was founded in 2016 by a one Misha Wilson who I am told is a pretty well-known internet marketer. I hadn’t actually heard of him until I started researching this company, but then again, I haven’t been in this industry very long. So, Who Is Misha Wilson? The bio for Misha Wilson on the Super Affiliate Network website is a little vague, apparently (and I don’t know how they verified this) he is the youngest and fastest growing traffic and conversion expert on the internet. Some bold claims but then again, this is the internet and anyone can be whatever they want if you manage to gain a large following and Misha Wilson has very large and loyal following. Not to say that he isn’t good at traffic and conversions, he must be, otherwise, he wouldn’t be the owner of a successful network marketing company. A quick Google search of his name revealed a few more details about his life which I do not want to bore you with, suffice to say I do admire his no give up attitude and his willingness to strive for success even in the hardest of times. Although I must add that my search revealed that he has been in a couple of network marketing companies and was one of the top earners in both. One thing I did find funny, in his bio page it states that 97% of his teammates failed in network marketing and he wanted to change that, so what did he do? Open his own network marketing company!! What is the Super Affiliate Network? According to their about us page, they are a group of entrepreneurs from around the world who want to help others build successful online business and live their dream lifestyle. They even have their own manifesto which I found a little weird and a bit cult-like. When I first read it,I imagined Misha and his group of ‘entrepreneurs’ gathered in a circle and recite this in unison before every meeting. Before signing up to the Super Affiliate Network, I had to sit through a pitch fest for the system, I wish they had a simple purchase page, nothing more annoying than to hear MLM companies telling you how easy it is to replicate this system and make 6 figures. As usual, there were a few testimonials on the sign up page, as you can see below, everyone seems to be a six-figure earner within a few weeks of the training provided by the Super Affiliate Network. However, as I show later one, this a very deceptive marketing tactic. Now, if I was a complete newbie, I would have fallen for these deceptive testimonials but I have been burnt by a couple of network marketing companies that follow the same business model and I have learnt my lesson. A side note, one of those companies was actually shut down by the FTC for being a scam!! Now, I am not saying that this system is a scam, but the FTC seem to be going after companies that make ridiculous income claims, so just be careful if you ever decide to join. So, basically, the Super Affiliate Network is a training program in which people are taught how to make money through affiliate marketing with heavy emphasis put on mindset training, email marketing and advertising through solo ads. For solo ads, they have their own in-house done for you traffic system, I believe this is their own hand-picked list of solo ad vendors that have the most responsive lists. I have my concerns with these done for you traffic packages,for one thing, everyone in the system (and they have a pretty big membership) is offered the same traffic deals so sooner or later all the lists will be beaten to death and people will get wary of receiving the same offers from different people. Not to mention the traffic packages can be very expensive and you could very quickly lose a lot of money (which in MLM companies are a regular occurrence). You will be assigned a ‘business coach’ who will guide you along the 21 module course and answer any questions you may have. I have deliberately put quotation marks around business coach because, in my experience with similar companies, they are more likely to try to upsell you rather than help you out. Maybe this is different, just be careful if you ever decide to join. A one-time special offer made after you purchase the monthly membership, this gives you access to a course called ‘Solo Ad Success Formula’ where they will teach you advanced strategies around email marketing. In my personal opinion, this is a waste of money, there are many free resources regarding how to achieve success with solo ads and there are paid courses that cost no more than $15. How they are willing to charge people $97 -$297 for stuff you can find way cheaper is why the MLM industry has such a bad reputation. Access to a monthly video newsletter from Misha Wilson regarding company news, industry updates and what is currently working that can help your online business. You will also get access to the private Facebook group and free access to any products that may be developed in the future unless the products are above this membership level. Yes, there is one more membership level and it’s the best one yet!! No MLM product line would be complete without an overpriced holiday masquerading as a mentoring program held in one of the most beautiful places in the world. In the case of the Super Affiliate Network, they will take you on a 4-day intensive event in Maui where they will hold your hands and help you with everything from creating high converting sales funnels to running webinars. Everything you should already have learnt from the previous membership levels!! So, let’s get to what this is really about and that is another way for the Super Affiliate Network to fill their coffers, pay the top earners ridiculous commissions and have a nice 4 day holiday in beautiful Hawaii. They have 30 days no questions asked refund policy for most of their products and they also offer some extra cash for ‘wasting your time’. The extra cash offer is conditional though, you will have to prove that you undertook many of the tasks involved within those membership programs. Personally, I don’t really care about the extra cash, as long as they have a robust refund policy and do not renege on it, that is enough. There are too many stories about network marketing companies not honouring their refund policy or making it so hard and confusing that people don’t even bother. The Super Affiliate Network runs a two-tier affiliate program, you can earn as much as 70% on any direct members you recruit and 5% on tier two recruits. However, to be eligible for affiliate commissions for any product sales, you would be required to already have purchased that product yourself. This is primarily one of the reasons these products are sold, not because they provide amazing value but because of the big commissions you can earn if you make an affiliate sale. Can the Super Affiliate Network and Misha Wilson make you rich? Yes, if you have a large budget, have experience with advertising and don’t mind selling overpriced products. Don’t get me wrong, there is probably some good stuff in the expensive membership programs, however, the basic membership isn’t worth a monthly subscription plan and I am always wary of systems that sell you done for you traffic packages. Since everyone is offered the same deals, only a few will make a positive ROI and the majority will lose out. The problem with MLM companies is that they always lead with how much money you can make with them and not how much value people will get. It is a known fact that the majority of MLM reps lose out and this is the same with the Super Affiliate Network. If you read their income disclosure (which is tough to find), it states that the average earning for their members is between $150 – $2500 per year!! And yet their testimonials on the sign-up page insinuates that earning big sums of money is easy. It is easy to get sucked into the world of MLM and really want to believe all the hype,I know because I have been there, it was tough to admit to myself at first but eventually, I got out. If you want to learn how to start an affiliate marketing business the proper way, try my no.1 recommendation. They have been in business for over 13 years, have helped thousands of people build a successful online business and continue to improve the training and tools they provide. Click on the button below to find out more. Great article overall, but something you said in the conclusion really resonated with me: that “The problem with MLM companies is that they always lead with how much money you can make with them and not how much value people will get.” It reminded me of something my college advisor said back when I was first considering attending graduate school. She told me that jobs in higher education are hard to find, and that people who get advanced degrees have to willing to say, honestly: Yes, this degree will add value to my life, even if I can’t make a career of it. With that statement, I thought back over your description of The Super Affiliate Network and my own peripheral experiences with MLM companies, and I had to think – Yeah, no one joins these because the program itself adds some value to their lives. They join only for the money. The goal is to use the program to make enough money to have time to then go somewhere else and maybe, finally, find something that does make life worth while. Maybe there’s a better way to approach things which starts with value, and gets to the money later. Thanks for the comment, its a sad indictment of the MLM industry that they only way they can sell their products is through selling a dream of financial freedom. Otherwise most of them would not be in business because their products are rubbish and would never sell for the prices they charge. Thanks for exposing yet another deceptive make-money-online scheme. I have never heard of this one, but the extravagant testimonials and pyramid structure are too familiar. Ignoring the hype and seeing through to the truth about average earnings is really important. There are better ways for those who are willing to do their research and put in the work. Thanks for your comment, yes its important people read the small print when looking into a business opportunity, that is where the truth is revealed. When I see multilevel marketing I am lost already. Isn’t it amazing that so many MLM companies claim they are not MLM but then you look at their commission structure and the downlines…. And regarding the claims made about these “internet marketing gurus” they really bore me to tears. I can also put in my bio large claims about my success but they are not true. Yes a make a living blogging but I am not a millionaire and I don’t drive a fancy car. All of these “internet gurus” claim that all they want is to help other people succeed. Not for a minute do I believe that. Their #1 purpose is to make themselves succeed through marketing themselves to you! And testimonials – don’t even get me started. I can also make those up and plonk them on my websites. Thanks for sharing this review on Super Affiliate Network – it looks to me like another overpriced MLM scheme that holds zero interest for me. Hi Minhaj, thank you for explaining this Super Affiliate Network. I think twice before I step into this. It is a lot of money and I do not really see an equivalent. I found a button under this story to the review about Wealthy Affiliate. I must say, that looks a whole bit more attractive. I have learned that earning online does not happen overnight, that you have to work for it. Very nice that Wealthy Affiliate gives a free trial period and a free start account. Worth trying. Thanks for your comment, yes Wealthy Affiliate is a superior alternative not only to Super Affiliate Network but any other system that claims to teach you affiliate marketing. Hey Minhaj, this is a very thorough write-up and interesting to read. Haven’t heard of this specific program, but like you said, it’s like so many others. They keep trying to lure in the inexperienced with the same promises of making lots of money and telling you that everyone can do it. They throw in all those shiny objects (upsells) for you to buy and unfortunately this scheme really works as so many get burned by this. The upsell to Maui is completely crazy. So much money for a private tutorship. But that’s what all these programs are about. Creating this rich and glamorous profile, the lifestyle everyone dreams about. That Maui event and its price tag really thew me off, I keep wondering who pays to go to these events and think the money was well spent? My mind boggles!! Thank you for this clarifying post. I for sure will not try Super Affiliate Network. Reading the article I came upon that Misha Wilson never gave up, That, of course is needed in bussiness, actualy one needs to never give up in life in general. I have my own experience with quite a few MLM in the 1990,s. Some were good and others not good at all. At this present moment I still am with Forever Living Products as their Aloe Vera products are excellent. I do not work anymore as I never really made money even if I had a downline. All this was before these type of MLM,s the internet was not used much. As you very well pointed out this is buying yourself into the system, for sure it is not cheap and when you can get the same somewhere else cheaper it borders a scam in my eyes. The use of photos, testimonials and these high earning numbers are misleading to say the least but people will fall for it just the same. Most of the time the photo belongs to people who sell them and you will suddenly see the same face on a get slim campaign. Yes, the use of those photos and testimonials are very misleading, and the products are way over priced. Its why I always warn people against joining MLM companies. There are far better and cheaper alternatives. Wow…. 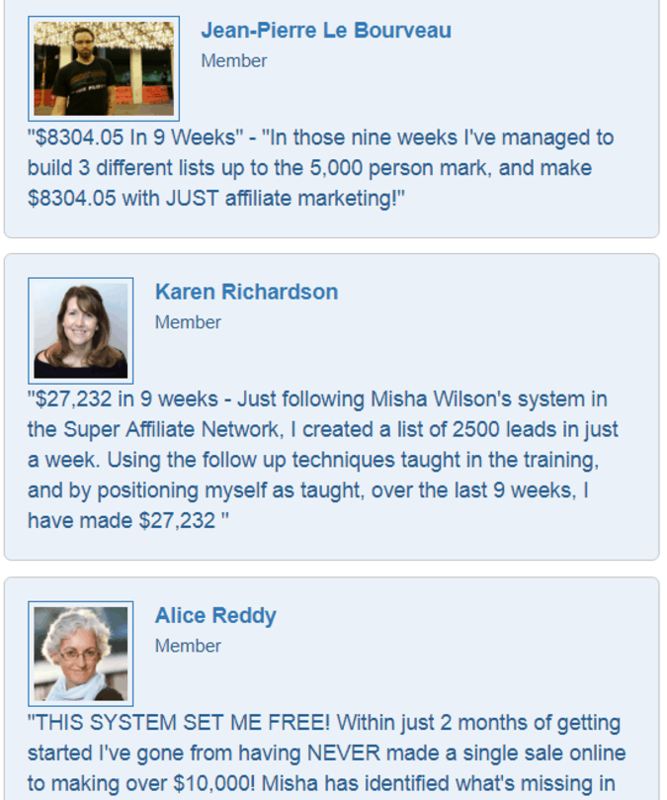 i have never heard this super affiliate network before. Thank you to bring this to the notice. Though i hate all these business oriented that want to turn ones to minillionaire over night, that always scared me. Like you said that one need huge capital before making money with them. And all thier tricky testimonial can make many people fall to the pich. This will be a causion for many people who are finding quick way to make money. Thank for the brain behind the WA. This article help me a lot and it is full of informative and over great value for all online job seekers. I can not understand how people still believe in this especially when they see those big number. You did an awesome review about this network and people need to understand that such scams exist they are there only to take money from the users. I would advise everyone to stay far from MLM. Great review, and yet another MLM company taking too much money for very little offered. I’ve had one experience with and MLM company. I purchased two of their upsells and when I raised my concern with them that there is nothing new training wise in the new tiers (just spun out generic info that was already given at the first not so good level), they became very unpleasant and bombarded me with emails. I had to close that email since. I wrote this story just to illustrate why I agree with you that some MLM companies are not very good and why one should stay away from them. If you wish to work online, you need to learn the business and how to go about promoting products online anyway – why not learn how to do it for yourself, rather than for some MLM company? Have your own business and be your own boss! Affiliate marketing is one of the best ways to start a business and I would recommend it to everyone! Thanks again for another great review post and providing helpful information on another make money online product. Affiliate commissions is the by-product, helping people is the main thing. After reading your thorough review personally I prefer NO NO to Super Affiliate Network. I do agree with you affiliate marketing and drop shipping are the best models to earn long lasting online income. And Wealthy Affiliate is the best platform I came across to learn about earning money online. Although I have no personal experience with the Super Affiliate Network it sounds very familiar to me. You can’t call these companies scam, because they still offer some education. Nevertheless, their up-selling is brutal and I’m sorry for all the newbies, who believe their get-rich-quick-schemes. Thanks for your review and revelation of SAN. Is there any good program for dropshipping, you can recommend? Great review and very well explained. Totally agree with you, is easy to fall into this hype, but sometimes it only takes some thinking to know that all this hype is not true. After learning a little bit about how the internet world works in term of building a business and making money online, I realize that none of this programs that offer you a quick, easy and rich fast are true, they might not be a total scam, but is not true that you can make that amount of money so fast and easy. I have been invited to some MLM business and always say not (thanks God) but my no will be more firm now. Also agree with the affiliate marketing I think is the most flexible and solid way to make an income online. From my experience you need to work out your business online to make money, nothing comes really free, you will need at least effort and time.